Wide Web soft Embossing Machine is made for large scale production of Holographic Films. It is a very significant equipment as the demand of Flexible Packaging and decorative Industries is on the rise and the particular equipment is very well equipped to produce Holographic Films in 40″ width. 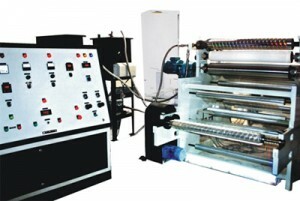 Wide Web soft Embossing Machine is a user friendly machine as it has sophisticated and precision computerized controls to allow the buyer enough provision for adjustments. This arrangement specially help in altering the Embossing Pressure, Line speed and temperature with the help of Oil heating system. These Oil heating system also helps to maintain a uniform temperature throughput the embossing roller. These altercation may actually prove to be beneficial for producing Holographic films of the highest order. This Equipment has been designed for Mass Production of Holographic Films up-to 1050 mm , to meet the ever growing demand for Flexible Packaging and Gift Wraps and Decorative Industries like Wall Papers , Carry Bags and other sophisticated Gift and Consumer products. The Line is equipped with Sophisticated Programmable Controls for precise adjustments of various production parameters like Embossing Pressure, Temperature, and Line Speed etc. to ensure production of Holographic Films of the highest standards. While designing the machine, particular attention has been given to the Conditioning and Re-Conditioning of the Film during the Embossing Process, in order to obtain the optimum Embossing Effects. Precise Temperature Control of the Embossing Roller, which is a pre-requisite for quality embossing, has been achieved by a Central Oil Heating System which maintains a uniform temperature throughout the length of the Embossing Roller, on a Real Time Basis. Rewinding Roll Dia: 450 mm max. Embossing Speed: Up to 35 Meters / minute Depend upon the Materials.